- There is a limit of 3 courses per order. An all new Personal Sponsorship Course offered by Studie and BMW! 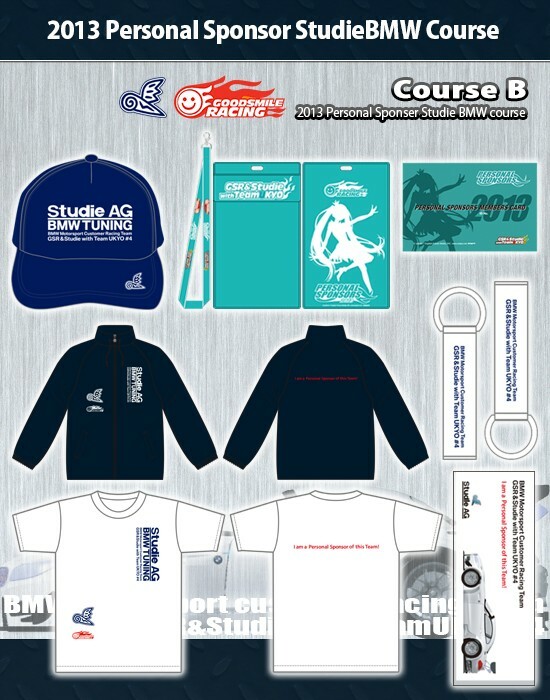 Includes all the benefits included in Course A and more, with special windbreaker and team cap only available at this sponsorship level and absolutely nowhere else! Windbreaker features BMW Motorsports work wear's mainstay deep navy color, with team name in Japanese-style vertical print at the upper left and the Studie and GSR company logos on the bottom right, both in basic white. Back features the message "I am a Personal Sponsor of this Team!" in small point red lettering - flashy but not too loud. Perfect for wearing to a race or any other event to show your continued support and cheer on the team! But that's not all, the special team cap also available only at this sponsorship level features the same simple navy color with Studie AG, BMW Tuning, and the team name in in simple white font. Perfect for wearing to the circuit or out on the streets, as well as to any summer beach getaways this summer. Through everyone's donations and continued support, we're able to purchase spare parts, upgrade parts, and even buy sports drinks for the drivers to quench their thirst in the heat of the race - everything that it takes to empower the team and take our performance to the limit, so we can reach our goal of "taking back the throne" this season! *As this course includes all the benefits of becoming a Personal Sponsor, this cost is reflected in the price. *All new 2013 Personal Sponsors will be sent a Personal Sponsor Card and Ticket Holder. *Personal Sponsor Cards and Ticket Holders will only be issued 1 per person. Even if you place more than one Personal Sponsor Course order, only 1 of each will be issued. Please note that if you have ordered any 2013 Personal Sponsor Course, future orders will not includes these benefits. We appreciate your understanding. *Please note that supplies are limited. The application period will close once quotas have been met. - You can choose payment either Credit card or PAYPAL. - Your credit card will be charged on order, and not when the product is sent.